Organic Valley Organic Milk is Available at Costco! 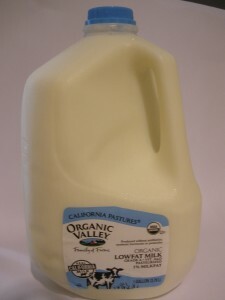 My Review- This milk, Organic Valley Family of Farms 1% Pasteurized Organic Milk, just tastes like any other average 1%. It has a nice consistency and nice flavor although it is a little less creamy than my favorite 1% – 365 Organic. This is the lowest price organic milk that I have come across yet. I bought it at Costco in a 2 gallon pack. It is great to see organic products showing up in the mainstream stores. I actually had to wait in line to get mine! This is a good indication that others are also realizing the benefits of organic milk. Organic Valley Family of Farms 1% Pasteurized Organic Milk.